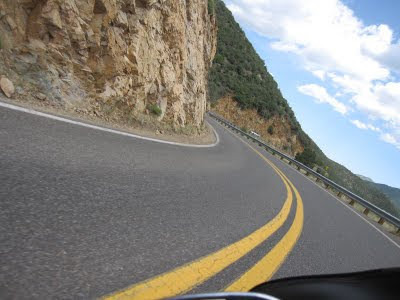 The hardest thing about photographing the road on twisties, is holding the camera with one hand, and the holding the handlebar with the other. On our overnight rides, I like to photograph roads as I ride them, mostly because those roads are so far enough away from home that I don't get a chance to ride them that often. Looking through all those old photos, it makes me want to go back there and ride them again. Some time ago, I finally got smart and decided to attach a chain to the camera, and hang it around my neck. That way if I need to grab the handlebars, I can drop the camera. Before that, I used to reach into my pocket, pull the camera out, take the photo, and put it back into my pocket. One time I did that, I found myself needing holding the handlebars with both hands really quickly, and ended up stuffing the corner of my camera into my mouth. Everyone seems to want to see photos of the ride, so it makes me feel good knowing that I have the camera, because I love taking photos. But I have to wonder if there's an opposite side to that, where people get annoyed by it. You can only take so many photos until it becomes too much. Like so many people today, I have a Facebook account. And I got into the habit of taking a photo, and uploading it to Facebook. But I wasn't going overboard with it. I'd have a friend snap a photo of me using my cell phone, and then upload it to Facebook, just as a way to keep a photo journal of my rides. A girlfriend of one of my riding buddies noticed that some of these photos showed her boyfriend in the background, or maybe we'd be seated at the bar having a good time. So, she requested to become a Facebook friend of mine. Then one day, I uploaded a photo of him and me chugging down some monster-sized margaritas at a mexican restaurant, in the outdoor patio, with bowls of chips and salsa in front. It was such an idyllic moment, I had to add it to my photo journal. He later told me he got busted. His girlfriend didn't know he had been out riding with his buddies, drinking down margaritas, and I guess she got jealous, peeved, or something. So, I'm much more careful about what photos I take, and what I upload. Twisties are where it's at. You could buy or make a helmet or handlebar bracket, as I did a few years ago, or break down and buy a GoPro. Don't risk having an accident riding with one hand and a distraction while trying to dodge the line crosser.